McDonough Braungart Design Chemistry (MBDC) is the organization founded by internationally-acclaimed architect, William McDonough and the renowned chemist, Dr. Michael Braungart – they are undisputed pioneers in sustainable (green) building practices and inventors of the highly regarded designation, the Cradle to Cradle® (C2C) Certification. MBDC provides Corporate Environmental Strategy, Product & Material Consulting, Educational Services as well as the well-known C2C certification for business of every scale and designation across the world. 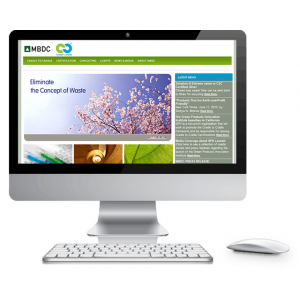 We were tasked with designing & overseeing the development of MBDC’s new website, the hub of their business – no short order for a company who’s specialization includes the ever-changing landscape of ‘green design & practice.’ MBDC handles the highly technical data associated with sustainable design, leading business clients on a path toward ongoing environmental stewardship, sustainability and business prosperity. Working with esteemed enterprise businesses including Herman Miller, Steelcase, Method, Shaw and even Dow, MBDC advises companies on turning principle into product. MBDC integrates daily operation and corporate strategies that deliver on the principles of economic prosperity coupled with sound practices of ecology and business equity across the globe.